Former FBI Director James Comey told the Senate Intelligence Committee Thursday morning that he was "confused" and "increasingly concerned" about the "shifting explanations" President Trump gave for his firing just over a month ago. When Trump fired him, he initially pointed to Comey's handling of the Hillary Clinton email investigation, but then later conceded it was because of his handling of the Russia investigation and claimed Comey was overseeing a demoralized FBI in disarray. "So it confused me when I saw on television the president saying he actually fired me because of the Russia investigation and learned again from the media that he was telling, privately, other parties that my firing had relieved 'great pressure' on the Russia investigation," Comey said, referring to reporting on Trump's conversation with Russian officials in the Oval Office the day after the dismissal. "The administration then chose to defame me, and more importantly the FBI" Comey said, by claiming the agency was "poorly led." "Those were lies, plain and simple," Comey bluntly told the committee. He later said one of the reasons he began memorializing all of his conversations with Trump — which he had not done with President Obama — was because he "was honestly concerned he might lie about the nature of our meeting." "I knew there might come a day when I might need a record of what happened not just to defend myself" but also the FBI, Comey added. "My impression is something big is about to happen. I need to remember every word that is spoken," he said of the memos he wrote. Comey's opening comments follow the release by the committee of his written testimony on Wednesday, which ticked off in rich detail the extent to which President Trump pressed him about the Russia investigation. Comey wrote that Trump did ask him for a "loyalty" pledge during a one-on-one dinner and later asked him to scuttle the agency's investigation into former national security adviser Michael Flynn. The president has denied both those accusations. But Comey's testimony so far has only confirmed the many bombshell reports over the past few weeks about the private conversations he had with Trump, many of them unprecedented and possibly inappropriate. Comey told the committee he did see Trump's request for loyalty from him — an independent arbiter atop the FBI — as a sort of quid pro quo. "My common sense told me what's going on here is he's looking to get something in exchange for granting my request to stay in the job," Comey said. He also said that in a now-infamous photo just days after Trump's inauguration in which the president shook his hand and embraced him, Trump whispered in his ear, "'I really look forward to working with you.'" On Trump's February 14 private conversation with Comey in the Oval Office — the day after Flynn was asked to resign for misleading Vice President Pence over his conversations with the Russian ambassador during the transition — Comey said that he believed the president was indeed directing him to scuttle the investigation into Flynn. "I took it as a direction," which he didn't follow, Comey said. "I took it as, this is what he wants me to do." Comey also added that, at that time, Flynn was indeed in "legal jeopardy" over his ties and contacts with the Russians. He noted that Attorney General Jeff Sessions tried to linger in on that meeting, and he said that it was his "sense" that Sessions "knew he shouldn't be leaving." According to Comey's written testimony, he later told Sessions he didn't want to be left alone with Trump again. Comey said during questioning that he was "stunned" by that conversation and the president asking everyone else to leave and later said it was a "significant fact" to him as a prosecutor that Trump wanted to speak with him alone. Comey did testify that he didn't believe Trump was asking Comey to stop the broader Russia investigation being conducted by the Bureau, but that while his conversation with him was "disturbing," he didn't "think it's for me to say that the conversation I had with the president was an effort to obstruct." Later asked by Sen. Joe Manchin, D-W.Va., whether Trump's interactions with him over Flynn rose to the level of obstruction of Justice, Comey responded that was newly-appointed special counsel Robert Muller's "job to sort that out." Comey said he had indeed seen Trump's tweet last month suggesting that the president had "tapes" of their conversations — and that if those did exist, they would corroborate his testimony. "Lordy, I hope there are tapes," he told senators. And, Comey revealed, it was Trump's tweet about those alleged "tapes" that prompted him to call up a friend to leak the memos about his conversations with the president to the press last month in hopes it would lead to the appointment of a special counsel to oversee the Russia investigation. Republicans have already seized on one section of Comey's written testimony as vindication. The former FBI director does detail in his written submission to the committee how he did tell Trump on three separate occasions that he was not himself under investigation — a surprising assertion Trump put in his termination letter to Comey. Comey told the committee that deliberations with senior FBI leadership about whether or not to tell the president he was not personally under investigation beginning in January, before he was inaugurated, was not unanimous. "One of the members of the leadership team had a view that although it was technically true, we did not have a counter-intelligence file case open on then-President-elect Trump, his concern was that because we're looking at the potential — again that's the subject of the investigation — coordination between the campaign and Russia, because it was President Trump — President-elect Trump's campaign, this person's view was inevitably his behavior, his conduct will fall within the scope of that work. And so he was reluctant to make the statement that I made. I disagreed," Comey said. "I thought it was fair to say what was literally true — there is not a counter-intelligence investigation of Mr. Trump — and I decided in the moment to say it given the nature of our conversation." He later confirmed that when he was let go on May 9, there was no counter-intelligence, nor criminal investigation, of Trump individually, and that the president was not personally under investigation. Asked by Sen. Tom Cotton, R-Ark., as to whether or not he believed Trump colluded with Russia during the campaign, Comey responded, "I don't think I should answer in an open setting." Comey was also pressed by Republicans on the committee, including Florida Sen. Marco Rubio, why he didn't alert White House officials or the White House Counsel's Office about what he believed were inappropriate conversations with Trump and a breach of protocol. 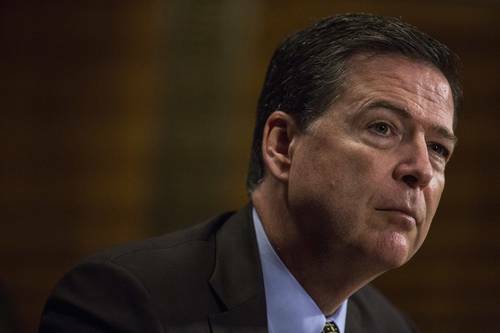 "I don't know," Comey responded to Rubio. "I think the circumstances were such that I was a bit stunned and didn't have the presence of mind." Republicans also pressed Comey on how he handled the investigation into Clinton's emails during the 2016 campaign, usurping then-Attorney General Loretta Lynch by announcing the FBI was not recommending prosecution for handling of classified information on Clinton's private server. Comey testified he was disturbed by Lynch's tarmac meeting with Clinton's husband, former President Bill Clinton, and that was one reason he made his announcement in July, though he did say at that time he believed Hillary Clinton had been careless with classified information. "I didn't believe she could credibly decline that investigation, at least not without grievous damage to the Department of Justice and the FBI," Comey said of Obama's attorney general. Comey said it made him uncomfortable that Lynch had directed him to refer to the Clinton email investigation as a "matter" and not an investigation, even though she was, indeed, under criminal investigation. Pressed by Sen. John McCain, R-Ariz., as to why he didn't call for an independent counsel to handle that matter, Comey said that he "knew there was no case there" and that "calling for a special counsel would be brutally unfair." It's unclear how the White House will respond to Comey's testimony, but it could come from the president himself in tweets or remarks Thursday. Meanwhile, House Speaker Paul Ryan defended Trump at his weekly press conference, arguing that one reason the president had unusual conversations with Comey was because he was a novice president learning the ropes. "Of course there needs to be a degree of independence between DOJ, FBI and the White House and a line of communications established. The president is new at this. He's new to government. So he probably wasn't steeped in the long-running protocols that establish the relationships between DOJ, FBI and White Houses," Ryan said. "He's just new to this." Ryan was pushed by a reporter who asked how being new is an acceptable excuse when he has staff and legal counsel. "I'm not saying it's an acceptable excuse, it's just my observation," the House speaker replied. "I think people now realize why the president is so frustrated," Ryan also added. "When the FBI director tells him on three different occasions he's not under investigation yet the speculation swirls around the political system that he is, that's frustrating. Of course the president is frustrated, and I think the American people now know why he was so frustrated." Share your insights: What do you think of Comey's testimony? WASHINGTON — Assurances to an incoming president that he was not under federal investigation. A president's unprecedented request for loyalty from an FBI director. A "very concerning" request from the president to end an investigation into a devoted presidential appointee. Lawmakers hungry for answers and frustrated by the reticence of national security executives to provide them. It's been a month of extraordinary drama since President Trump fired FBI Director James Comey, rife with leaked details of private memos detailing awkward interactions with the president and the rare appointment of a special counsel to alleviate concerns of White House interference in an ongoing investigation. 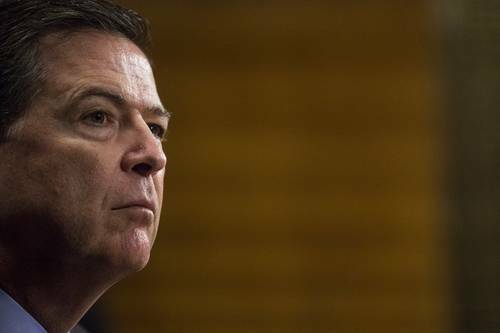 A day before Comey's much-anticipated testimony before the Senate intelligence committee, the former FBI director's prepared remarks were officially released, bringing into public view new details in the Trump-Comey saga. 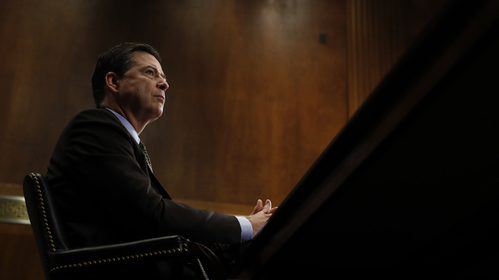 The testimony, Comey's first public comments since his May 9 firing, unfolds against the extraordinary backdrop of an FBI investigation that has shadowed the Trump White House from the outset and threatens to cripple its agenda. 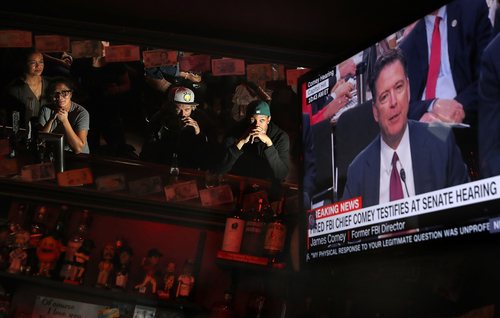 At the time he was fired, Comey had been overseeing the investigation into possible coordination between Russia and the Trump campaign for months. The White House's stated reasons for firing Comey were contradicted by the president himself, raising questions about whether Trump had fired Comey to derail the Russia investigation. The White House initially said Trump was acting on the recommendation of Justice Department leaders, citing as justification a memo from Deputy Attorney General Rod Rosenstein that lambasted Comey's handling of the Hillary Clinton email server investigation. But Trump gave a different explanation when he said in an NBC News interview that he had already decided to dismiss Comey and was thinking of "this Russia thing" when he did so. Trump's actions and justifications presented the possibility that Trump's intention was to obstruct justice. Comey, a skilled raconteur who generally tilts in favor of openness, is well-accustomed to the spotlight and in particular to sensational congressional hearings, including one 10 years ago in which he revealed a dramatic hospital room clash with Bush administration officials. Thursday's testimony before the Senate intelligence committee is expected to be his most dramatic yet. The official release of Comey's remarks on Wednesday afternoon came shortly after the conclusion of testimony from Comey's former national security peers who refused to answer senators' questions about their own interactions with Trump. There have been reports that the president tried to pressure NSA Director Mike Rogers and Director of National Intelligence Dan Coats to publicly push back on the investigation. Did the president ask Comey for his loyalty? Yes. "I didn't move, speak or change my facial expression in any way during the awkward silence that followed," Comey said in his written testimony. Did the president ask Comey to stop investigating his former national security adviser, Michael Flynn? Yes. "I had understood the president to be requesting that we drop any investigation of Flynn in connection with false statements about his conversations with the Russian ambassador in December," Comey said. How often did Trump and Comey communicate with each other before he was fired? Nine times, Comey said. "Three in person and six on the phone." After one of these encounters, did Comey actually tell Attorney General Jeff Sessions that he did not want to meet with the president alone again? Yes. "I took the opportunity to implore the Attorney General to prevent any future direct communication between the President and me," Comey said. But Republicans are likely to press Comey on why he did not raise his concerns about Trump publicly or resign. Some may attempt to divert attention from Comey's remarks about Trump by focusing on two issues they've repeatedly seized on: leaks and revealing the names of Americans in intelligence reports. The White House said Monday it would not invoke executive privilege over Comey's upcoming testimony — officials predicted it would look bad otherwise. 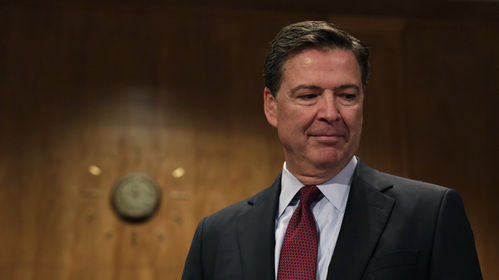 Comey, who is used to not answering lawmakers' questions about ongoing investigations, is not likely to say anything Thursday that could interfere with, or undercut, the ongoing federal investigation into Russia ties. That investigation is being led by Robert Mueller, Comey's predecessor. Mueller was appointed as a special counsel by the department last month. The two former FBI directors are known to have warm feelings and respect for each other. A Comey associate has said he obtained Mueller's permission to testify. On Tuesday, Trump was asked what his message for Comey would be. He said, "I wish him luck." WASHINGTON — In a hugely anticipated hearing, fired FBI director James Comey will recount a series of conversations with President Trump that he says made him deeply uneasy and concerned about the blurring of boundaries between the White House and a law enforcement agency that prides itself on independence. Comey has not spoken publicly since he was abruptly fired by Trump on May 9. His dismissal, four years into a 10-year term, fueled claims Trump's ultimate aim was to quash the investigation and obstruct justice, potentially a federal crime or an impeachable offense. Some legal experts said Comey's account could bolster such a case. White House spokesperson Sarah Huckabee Sanders said she was unsure if the president read Comey's testimony after its release. Asked whether the president stood by earlier assertions that he had neither sought Comey's loyalty nor asked for the Flynn investigation to be dropped, she said: "I can't imagine the president not standing by his own statement." Ex-FBI Boss Comey Heads To The Senate: Can It Live Up To The Hype? James Comey is expected to tell Congress that, yes, he did tell Trump he wasn't under investigation — but that Trump asked him to back off Mike Flynn. • Comey's prepared opening remarks for his testimony are already out. According to the testimony, Trump told Comey, "I need loyalty. I expect loyalty," during a dinner in January. Read the whole statement here on Document Cloud. • Preparing for any potential damage from Comey's testimony, the White House is looking for ways to undermine his credibility. For his part, President Trump said of Comey, "I wish him luck." • In the days before Comey was fired, he asked for more resources for his investigation of Russian interference in the 2016 presidential election. And this week, there's been a string of leaks relating to the Russia probe. It's a lot to take in, but Vox has compiled a nice list of the latest. • Trump could've used executive privilege to block Comey from testifying, but he did not. Through a spokeswoman, Trump said he wants a "swift and thorough examination of the facts." • And since Russia is so focal to this whole thing, here's an explanation of why the election-meddling investigation matters and why you should care. The former FBI director opened his Senate testimony Thursday by stating that the administration's explanations for his firing confused and concerned him. He didn't say what the lies were. Former FBI director James Comey says he thought during a January dinner with President Donald Trump that the president was "looking to get something" in exchange for allowing him to stay on as FBI director. Comey is describing his views that the president was trying to create a type of "patronage relationship" at the start of the Trump administration. The ousted FBI head is testifying that the president told him before the dinner he hoped he would stay as director. Comey says law enforcement leaders aren't "supposed to be peeking out to see whether your patron is pleased or not with what you're doing." Former FBI director James Comey says he took "as a direction" President Donald Trump's remark that he hoped Comey would drop an investigation into former National Security Adviser Michael Flynn. Republican Sen. James Risch of Idaho asked if Comey was aware of anyone being charged with obstruction of justice because they expressed hope for a certain outcome. Comey says he wasn't. But Comey added at his Senate hearing: "I took it as a direction," and noted that the remark came during a one-on-one meeting with the president of the United States. President Donald Trump has so far stayed off Twitter during former FBI Director James Comey's testimony. But his eldest son hasn't. Donald Trump Jr. is posting repeatedly during the closely watched testimony Thursday. He repeatedly defended his father and attacked Comey. He also cast doubt on all of Comey's testimony and said he should "have actually followed procedure." Donald Trump Jr. and his brother Eric are now at the helm of their father's New York-based business. 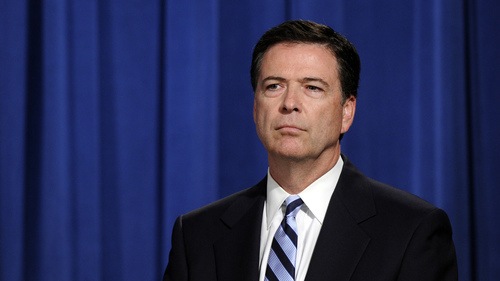 Comey says "Lordy, I hope there are tapes"
Fired FBI Director James Comey says, "Lordy, I hope there are tapes," of his conversations with President Donald Trump. Three days after Trump fired Comey, the president tweeted that Comey should hope there are "no tapes" of their conversations. Comey says he chose his words carefully when responding to Trump because he was "so stunned" by the conversation. Comey was recalling a February conversation in which, Comey says, Trump said he hoped Comey could let go the FBI's investigation into Trump's first national security adviser Michael Flynn's calls with the Russians. Former FBI Director James Comey says he didn't announce that President Donald Trump was not personally under investigation because "it creates a duty to correct, which I've lived before." That's a reference to the investigation into Hillary Clinton emails when Comey said late in the 2016 presidential campaign that the FBI was further investigating the case. Comey is explaining in his Senate Intelligence Committee testimony why he was reluctant to announce that Trump was not under investigation. He says he wrestled with the decision but said he didn't want to say it publicly because it would create a "duty to correct, which I've lived before and you have to be really careful doing that." Ousted FBI Director James Comey says he knew of a "variety of reasons" why Attorney General Jeff Sessions' involvement in the Russia investigation would be problematic before Sessions recused himself in March. But Comey said during his Senate testimony the reasons are such "that I can't discuss in an open setting." He said career officials in the Justice Department had been urging Sessions to step aside from the probe. Sessions did so in March, after it was revealed that he twice spoke with the Russian ambassador during the campaign. Sessions failed to disclose those contacts when pressed by Congress during his confirmation hearing. Comey said he doesn't know if Comey thought Sessions had adhered to that recusal. He added that that depends on the real reason for Comey's firing, which Sessions had recommended. Comey says in his hearing before the Senate Intelligence Committee that he felt that releasing the details of his private conversations with the president might prompt the appointment of a special counsel in the case. The ousted FBI head says he made the decision after Trump tweeted that Comey should hope there aren't any tapes. Comey says the contents of the memo were released to a reporter by a close friend of his who is a professor at Columbia law school. President Donald Trump's personal attorney Marc Kasowitz plans to make a statement following the congressional testimony of former FBI Director James Comey. 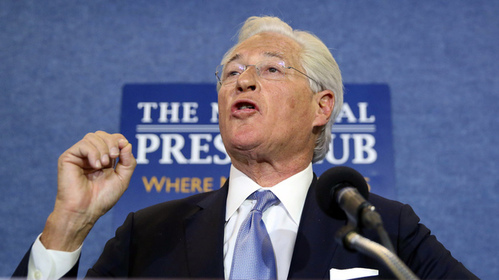 Kasowitz's remarks are expected Thursday afternoon in downtown Washington. This would be the first public appearance by Kasowitz. Comey says if any, "release all the tapes"
Ousted FBI Director James Comey says if President Donald Trump recorded their conversations, he hopes the president will "release all the tapes." Comey is being asked about the possibility that Trump may have recorded their conversations. The president alluded to that possibility in a tweet after he fired Comey in May. Comey says in his Senate Intelligence Committee testimony that he hopes there are tapes, adding the president should "release all the tapes." He says he's "good with it." Ex-FBI Director James Comey is testifying before the Senate Intelligence Committee, his first public comments since his firing on May 9. Here are his prepared opening remarks. White House spokeswoman says Trump "not a liar"
A White House spokeswoman says President Donald Trump is "not a liar." Former FBI Director James Comey opened his Senate testimony by saying the administration had spread "lies, plain and simple" and "defamed" him and the agency. The White House had claimed after Comey's May 9 dismissal that he had lost the confidence of rank-and-file FBI agents. Trump claimed separately in a television interview that the FBI was "in turmoil" and hadn't recovered. Trump spokeswoman Sarah Huckabee Sanders disputed Comey's testimony when asked about it during an off-camera briefing at the White House, saying "I can definitely say the president's not a liar." A White House spokeswoman says President Donald Trump has confidence in Attorney General Jeff Sessions — after days of refusing to answer the questions. Sarah Sanders tells reporters the president "absolutely" has confidence in Sessions and the rest of his Cabinet. Press secretary Sean Spicer had said earlier this week that he wasn't sure about the president's opinion on Sessions because he hadn't discussed the topic with him. Trump has been angry with Sessions ever since he recused himself from the investigation into Russia's interference in the 2016 election and possible connections with the Trump campaign. Trump vows to survive and thrive "siege"
President Donald Trump says he and his supporters "are under siege" but "will come out bigger and better and stronger than ever." Trump spoke Friday at the Faith and Freedom Coalition's annual conference at the same time as former FBI Director James Comey's was testifying before Congress. But in the first moments of Trump's his speech he said "as you know, we're under siege" and then vowed to survive and thrive. A year and a half ago, James Comey, then the head of the FBI, said "part of doing our work well is to make sure we don't talk about it." Today he testifies before the Senate Intelligence Committee. The chairman of the Senate Intelligence committee says there's more work ahead in the committee's investigation after hearing testimony from former FBI Director James Comey. Sen. Richard Burr says the committee plans to get together next week with the special counsel who's leading an investigation into Russian activities during the 2016 U.S. presidential election. Burr says the aim is to work on ways to avoid logistical conflicts with upcoming witnesses and testimony. President Donald Trump's personal attorney says the president "never, in form or substance" directed former FBI director James Comey to stop investigating anyone. That includes former national security adviser, Michael Flynn. Marc Kasowitz is responding to Comey's Thursday morning testimony, in which the fired FBI director said Trump urged him to drop the Flynn case. Kasowitz says that the president is "entitled to expect loyalty" from those serving the administration. But he says Trump never told Comey, "I need loyalty, I expect loyalty," in form or substance, as Comey claimed. President Trump maintained Twitter silence during the Comey hearing and he didn't mention Comey during a speech before a religious group. But his attorney and his eldest son teamed up to defend him. “The more we learn about President Donald Trump and his team’s connections to Russia, the more we have to be concerned about. “U.S. intelligence agencies have already confirmed that Russia interfered with the most fundamental aspect of our democracy—our electoral process—in support of Donald Trump, and that several members of the Trump team, including some who are now major players in the Trump administration, had suspicious contacts with the Russians. “It’s clear that President Trump fired former FBI Director James Comey because of the Trump-Russia investigation. And today’s explosive testimony by former Director Comey before the Senate Intelligence Committee makes the case even stronger that the President has continuously tried to undermine that investigation. “Former FBI Director James Comey’s testimony today revealed several things: First, that President Trump demanded Comey’s loyalty and tried to get him to beg for his job. Second, that President Trump asked Comey to end the investigation into Michael Flynn in order to cover up his campaign’s collusion with Russia. And third, that the President, his campaign, and the Administration repeatedly lied to the American people. “This is obstruction of justice.